Saute the onion, pepper, and celery in the butter until the onion becomes soft and translucent (6-8 minutes). Add the garlic and saute for another 1-2 minutes, being careful not to burn the garlic. Refridgerate this mixture until it is chilled – depending on your refridgerator, this could take 30-60 minutes. Preheat the broiler and set a rack in the middle of the oven. In a large bowl, combine the chilled veggies, the crab meat, bread crumbs, seasoning, and the mayonnaise. Use your hands like you would with hamburger meat. Then, just like hamburgers, shape the crab into cakes/patties and place equidistant from each other on a pre-greased cookie sheet. Try to get all of them to be the same size. Broil for 6 minutes. 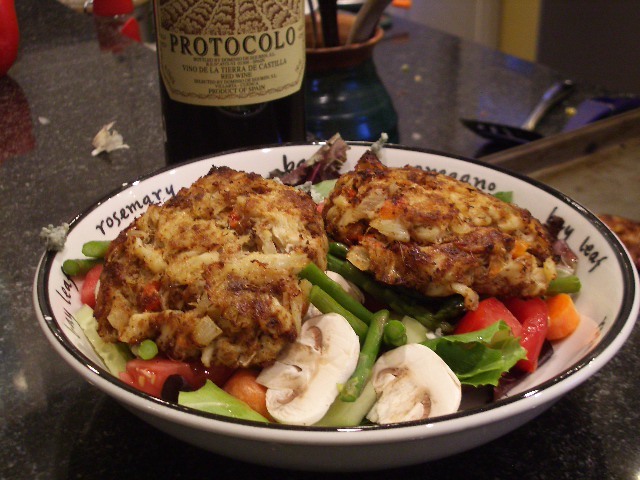 Take them out and flip each crab cake over carefully, so as to keep them in tact. Place back in the broiler for 5 minutes. Serve over a fresh salad and ENJOY! This looks awesome. Thanks so much for the new recipe and the crab cake tip. We will try it soon! Crabcakes hold together very well if you add a bechamel sauce to them when forming them. Very lightly dust them with bread crumbs, so that they will brown on top and bottom. Here is my recipe for the sauce. Combine the oil and flower in a large saucepan over medium-low heat. Whisk to make a smooth paste. Cook, stirring, constantly, until the mixture is a pale blond color, about 3 minutes. Gradually add the milk, and green onoins, whisking constantly, until the mixture thickens, about 5 minutes. Season with salt, pepper, nutmeg and thyme. If there are lumps in the mixture, strain before using.